It’s taken him 28 years but Kim Ok Sung grinned his way to his 500th career winner at Seoul Racecourse on Saturday and fittingly he did it aboard one of the grand old campaigners of the track, as Sing Sing Cat returned to the winner’s circle for the first time since 2013. It doesn’t sound hugely impressive but in actual fact it is. For many of those 28 years, Kim Ok Sung was, like every other jockey, restricted to five rides per week. He is one of very few jockeys of his generation who have managed to last more than ten years in the saddle in a fast changing racing environment where the young jockeys are far better trained than those who went before. He is 6th on the all-time winner’s list. If you had to choose a jockey to spend an evening on the soju with, it would probably be Kim Ok Sung. If you had to choose a jockey to bet your mortgage on in a race, it probably wouldn’t be Kim Ok Sung. Popular with punters with his man of the people routine and his ability to always be quick with a quip in retort to a heckle in the parade ring he has, to put it diplomatically, sailed close to the wind with the Stewards on a number of occasions. Yet somehow, he always manages to come out the other side and Saturday’s 500th win was typical. Riding 50/1 shot Sing Sing Cat, Ok Sung unexpectedly gunned him out of the gate into the lead and essentially pulled down the pants of the rest of the field who never got back on terms, the jockey punching the air as he and his mount crossed the line still a full 5 lengths clear of the rest. 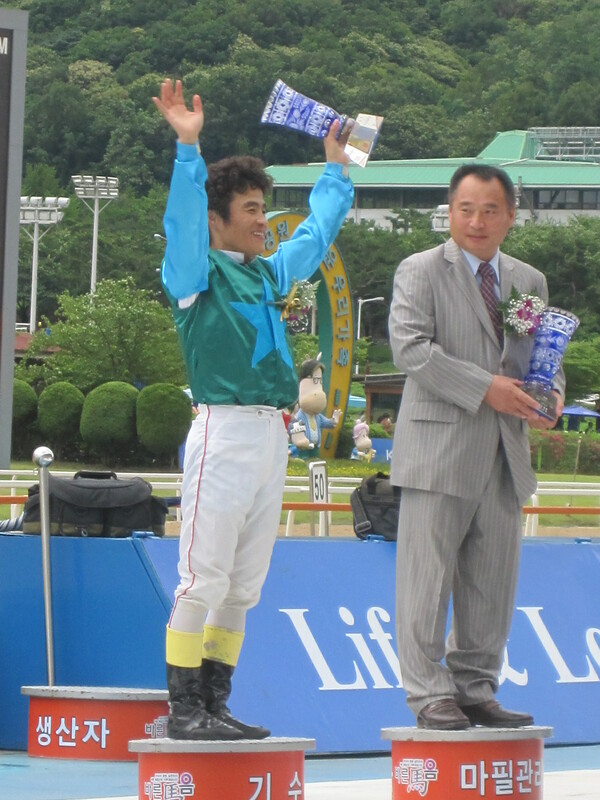 Champion jockey Moon Se Young was the first to congratulate him. Kim Ok Sung is nicknamed the “Smile Jockey” due to his ever-present Cheshire Cat grin. His biggest win was all the way back in 1996 when he won the Grand Prix Stakes on Hula Mingo. The grin was widened on Sunday when he rode winner number 501. A mention is due of Sing Sing Cat (D’Wildcat) too. He was a 50/1 winner on Saturday but back in 2012 he stunned Tough Win to claim victory in the KRA Cup Classic. A regular money winner since, the 7-year-old was recording his 12th win on his 41st start. Down at Busan, top-rated horse in the land Beolmaui Kkum slumped to his second consecutive defeat. This time it was Cowboy Son (Cowboy Cal) who won Busan’s Sunday feature race with Oreuse (Smoke Glacken) returning from a year out running 2nd and beating Beolmaui Kkum into 3rd. Now attention shifts to the Korean Derby. We are just five days away!